There's merely a question on how important an ERP solution can be for an organization. 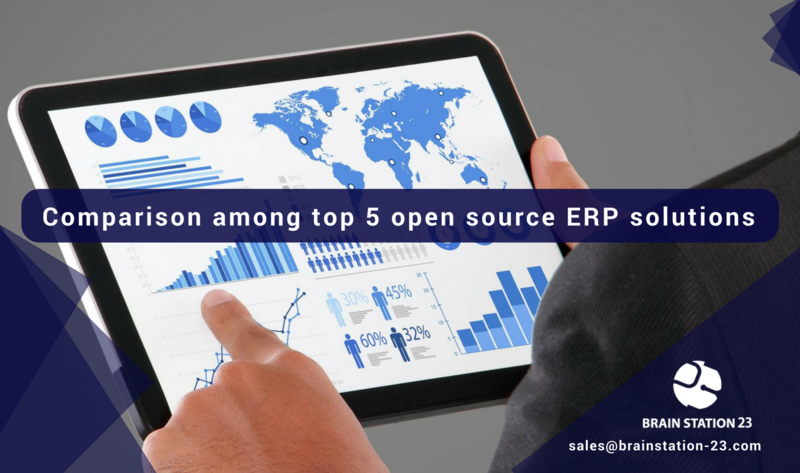 These days most SMEs are after open source ERP but while choosing open source it's very important to study among the options that are available. And this blog is especially for the SME's and Enterprises to ease that pain of study. In my previous article, I tried to point out the positive sides of adopting open source ERP over the expensive commercial ones. There are so many open source ERPs in market. But you have to choose the right one that fits to your business demands. In this article, I will shed light on five booming open source ERPs. Plus i will give a detailed module specific comparison among the particular top 5 open source ERPs. Odoo is one of the leading open source ERP softwares that has been in the market for the last 12 years. With strong technical foundations, Odoo framework is one of the unique one in the market. Most importantly, it provides top-notch usability that scales across all apps. Odoo’s powerful and easy integrable ERP system. It enables interactions of marketing, sales, quality control, products processes, supply lines, stocks and many other areas within a single database. For its consistent stability and regular updates for the clients, Odoo has become one of the best open source ERP in the market. This flexible platform also make the customization process easy for its users, even if they have the least technical knowledge on this platform. With the “On-premise” offer, Odoo is the most installed business software in the world these days. It is used by over 3.000.000 users worldwide ranging from startup companies (1 user) to large enterprises (of more than 300,000+ users). Dolibarr ERP is another popular open source ERP like Odoo downloaded 129,000 times. It comes with everything an ERP needs, including accounting, CRM, HR, inventory module etc. Probably, Dolibarr is a great option for businesses with in-house tech teams and those that want to be a part of a bigger ERP community. Cloud installations are possible, though you might be better off outsourcing to one of Dolibarr’s hosting partners. Prominent for the availability in all popular languages. ADempiere is another best open source ERP solution. This business suite has an industrial strength to combines ERP, CRM and SCM support for an overall business process. ADempiere also provides a framework for extending and customizing to meet business needs. Business Size: Basically for for retail based business. Openbravo is a retail-focused ERP based on a modular system. The software comes in three “flavors” depending on the needs of your organization. Openbravo Community edition is the free release, offering a stripped down version of the paid Enterprise and Professional editions. These editions include some premium, commercial modules – like financial management and inventory management – that many businesses find necessary. VIENNA Advantage is another prominent open source ERP out of Germany. The core product includes an ERP and CRM that the rest of the solutions revolve around. The platform of this ERP software is web-based. You can easily access it across devices without having to worry about some of the nitpicky compatibility issues that plague small businesses. Plus it also offer two cloud-based hosted solutions. One for SMBs and one for enterprise clients. Back in 2016, We decided to go after ERP based services. We found Odoo as one of the most convenient and efficient open source platform to work on. Our target was to serve all industry specific businesses. So, we went for Odoo as this open source ERP offers variant modularity along with customization facility. This internationally recognized open source ERP has been in the market for 12 long years having a huge customer base. It also give us the privilege to categorize our service into industry specific products. Visit our website ERP 23 to know more about our services. We have a talented team of Odoo developers and consultants dedicated to serve you the best ERP solution in Bangladesh. Plus we are the credible Odoo partner of Bangladesh to move towards digital transformation with business automation both locally and globally with an end to end solution.